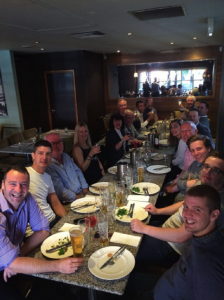 This month we headed to Bristol’s buzzing Harbourside to celebrate the special Birthday of one of our longest standing colleagues. Andy, our chirpy Cotswolds based Project Manager, who’s favourite saying is ‘Proud to be Stroud’, has been part of the Channel team for over 12 years. He started as a Systems Engineer before progressing to Project Manager, where he now plays a vital role in ensuring the super-smooth implementation of new systems. 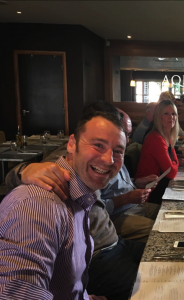 After a surprise Champagne toast in the office, we all enjoyed a delicious lunch at Aqua Italia, amidst the beautiful ambience of the waterfront. Judging by the look on Andy’s face, it was a totally unexpected surprise.